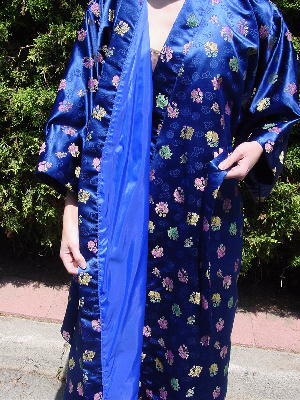 This long Asian coat is in a deep royal blue with leaves and flowers in grass green, yellow, dark pink, yellow-champagne, and Barbie pink. 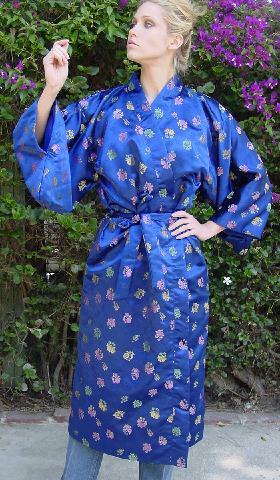 It can also be worn as loungewear. 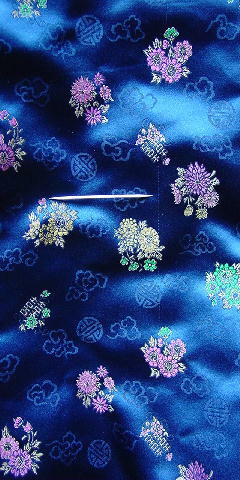 It has tone-on-tone freeform flowers and inscribed circle patterns. 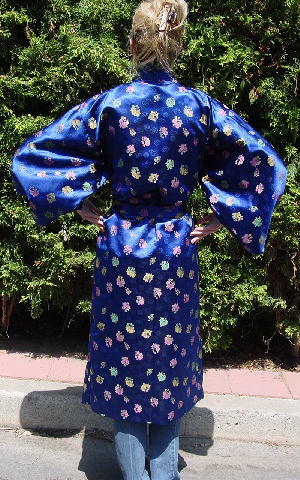 There are wide kimono 3/4 length sleeves with 1 1/2" bottom slits at the armpits and a 2" wide section which goes across the neck and down both front sides to the bottom hem. There is a thread pull on the back on the right side (it can only be seen in certain light) from top to bottom. We don't think it detracts from the appearance of the coat. 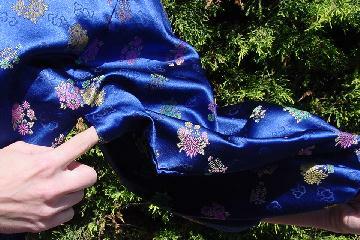 The long belt has two pieces of fabric sewn together to give it body. 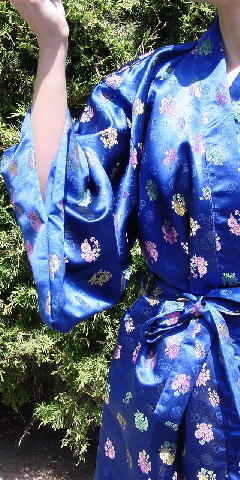 The sleeves have a rounded bottom edge. The wrist has a 7 7/8" wrist opening - the other part (5 1/4") is sewn together. It has a full light blue lining. We don't think it's silk - it feels like a very nice thick polyester. A model got it as a birthday present from her exboyfriend. She loved the coat but sold it because it brought back too many memories after they broke up. shoulder to end of sleeve 16 1/2"
shoulder to hem 48 1/2"
side to side bottom hem (2" front section overlapping) 28 1/2"
belt is 66" by 1 5/8"